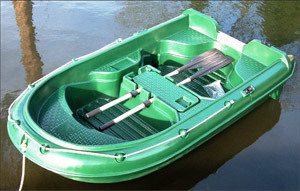 Available in three sizes, the Aqua Neptune range of boats are well designed, stable and robustly built in rotationally moulded HD Polyethylene. The Aqua Neptune offers exceptional value for money with prices starting from as little as £295.00, and its quality construction using heavy duty materials means you’ll have years of trouble free use. With its rigid design, the Aqua Neptune boasts exceptional stability and performance and as if that’s not enough, it comes with a fully loaded spec. The 250 boat comes as standard with an integral bench seat stow box, lock down security and storage for the supplied oars, and a third wheel positioned in the centre towards the bow, and a reinforced engine mount which takes motors up to a 4HP in size. Add to that a lifeline safety rope, rowlocks, a more than adequate drain bung and sculling point, and you really have a boat that caters for all your needs. Check below for all models and specs. Whether it’s for personal, club or commercial use, the Aqua Neptune has it covered; extremely light, easily manoeuvrable, robust and durable, and most of all extremely cost effective! The Aqua Neptune is available in Blue, White or Green. Aqua Neptune 250 Brochure (PDF). Aqua Neptune Range Brochure (PDF).